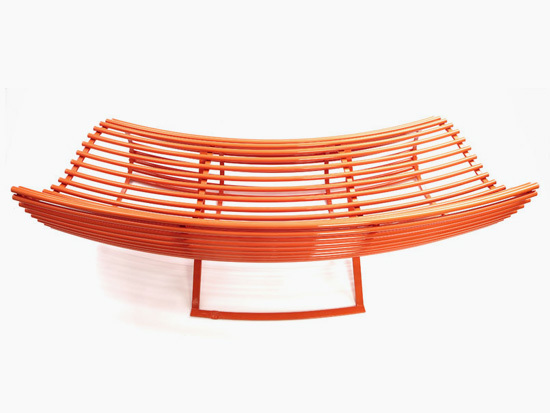 The Kirv Lo-Rise bench features compact proportions and sweeping curves. 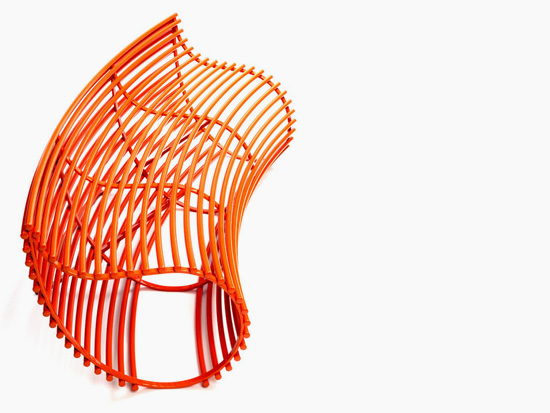 Its backless tubular form is a visual feast from every angle. Ideal for communal areas and private spaces, it is as beautiful outdoors as on covered concourses. The Kirv Lo-Rise uses the same profile as the Kirv Bench making it an ideal piece to be used in conjunction with it in any scheme. NB: Prices include VAT at 20%. Delivery isn't included, please give us your full postal address for an accurate delivery quote. The Kirv Lo-Rise is available electro-polished (link to finishes page) or powder coated (link to finishes page). We offer a choice of RAL colours as standard. Other RAL colours are also available for a small extra cost. 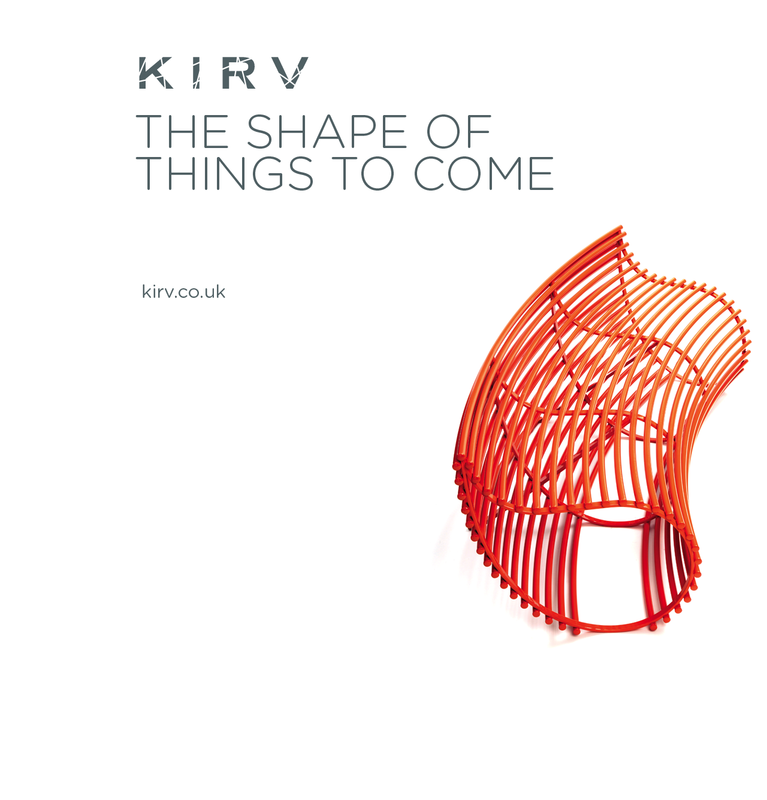 We can work with architects and designers from concept stage, or to existing schemes to customise the Kirv Lo-Rise. The bench’s length can be changed and the radius of its curve adapted. Similarly, finishes and colours can also be changed. If the Kirv Lo-Rise is to be used in a public space, unobtrusive security fixings can be provided. Handmade from 304 grade stainless steel, this contemporary bench is weather resistant and durable. Dimensions: 62cm high x 73cm from back foot to front of bench. All our products are designed and hand made by us to your order in the UK. Our prices reflect the quality of our products and the attention to detail they feature. We have a trade price list and can offer discounts for multiple orders. One of our primary aims when developing our seating collection was that each of our pieces should be comfortable. 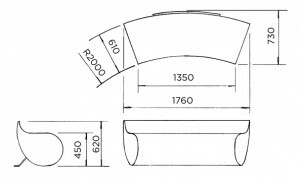 We spent a lot of time refining the profile of our seats to make them as ergonomic as possible. 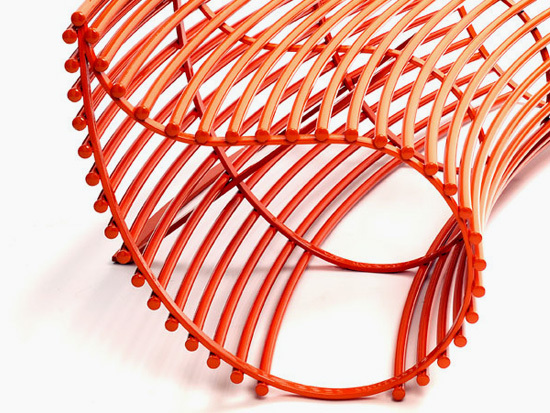 The close spacing of the tubes on our benches provides added comfort and support for the user. Maintaining outdoor seating can be time consuming and expensive. Our seats are designed to be left outdoors throughout the year and require very little maintenance to keep them looking great. 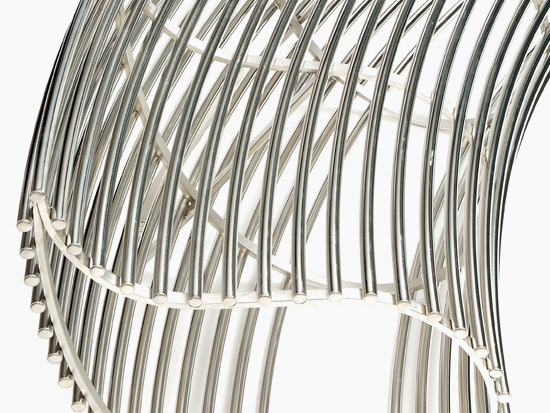 Stainless steel is one of the toughest materials available for outdoor seating and when finished correctly it has the ability to repair itself. All our furniture is available for event hire. Perfect for event launch parties and weddings. Are you looking for a unique piece of metalwork? We undertake commissions for both private clients and businesses. Copyright © Kirv 2011. All Rights Reserved.